You know what's better than a bowl of oatmeal for breakfast? A piece of baked oatmeal! The inspiration for this recipe came from Tasty Kitchen. 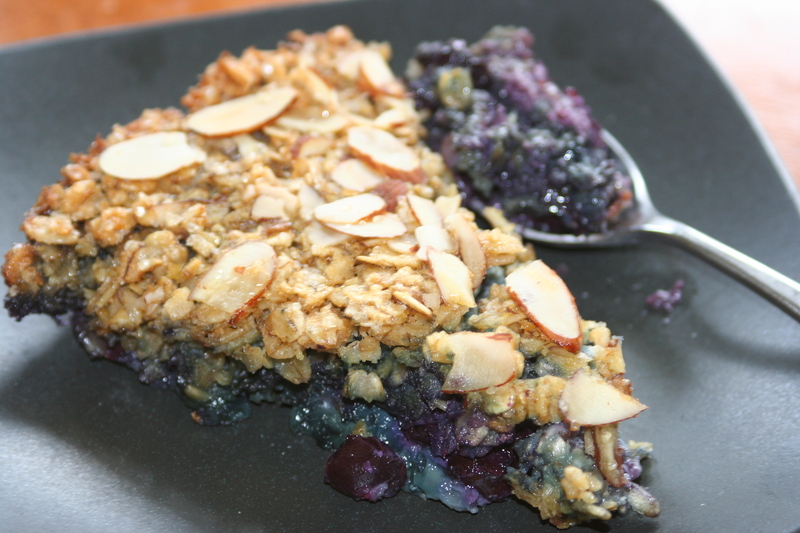 I "healthy-fied" the recipe and it's become a breakfast favorite. Most weeks I make a batch and we eat it for 3 or 4 breakfasts. This dish comes with high recommendations from both Jeremy and I! Preheat the oven to 350°F. Lightly grease an 8x8 pan. Melt coconut oil or butter and pour 1 Tablespoon in bottom of the pan. Pour fruit into the pan and sprinkle with 1 Tablespoon sugar and cinnamon. Set aside. In a bowl mix together the milk, maple syrup, eggs, vanilla, and remaining melted coconut oil. In another bowl, whisk together the oats, flax seed, coconut, baking powder, baking soda, and salt. Stir the wet ingredients into the dry and mix well. Pour mixture over the fruit and smooth the top. Sprinkle the top with almonds and remaining 1 Tablespoon of sugar. Bake for 40 to 50 minutes, or until browned on the top and blueberries are bubbly. Cool slightly. Serve with milk. glad you posted this! i will have to try it. These made my "Five to Try" post this week! I now have almost all these ingredients as regular staples in my kitchen! Yay for healthful habits one step at a time!